I remember the three Colin Davis performances from my high school years, when I had them on a Quintessence LP. (Missing here is Wagner's Siegfried Idyll, but it was reissued elsewhere.) 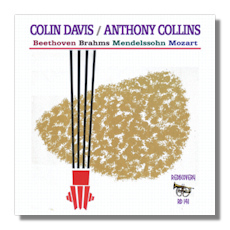 Both the Davis LP and the Collins (coupled with Mozart's Symphony #40) also appeared on the Classics for Pleasure label, but they originally were released by England's long-defunct World Record Club. The Sinfonia of London is very much still with us, though, even though it sounds like a nom de disque. It was founded in the mid 1950s as a recording orchestra, often for film soundtracks, and it continues to fulfill that function today. Anthony Collins himself was a prolific film composer, although he is less remembered for that today than for his recordings (for Decca) of music by Sibelius and Elgar. He passed away in 1963. Colin Davis – now Sir Colin Davis – keeps on ticking, however. He celebrated his 80th birthday in 2007. There's a reason why these performances, now about a half-century old, were repeatedly reissued and now have been rejuvenated by ReDiscovery – they're very good! Furthermore, the "Jupiter" boasts superior sound, so there's another reason to consider this disc. Neither Davis nor Collins does anything unusual with the music offered here. These are middle-of-the-road readings, yet they are not routine. Collins, in particular, shines in the "Jupiter" by making it big but not bloviating. The Menuetto, despite its weight, has an attractive bounce, and could that be actual joy I hear in the finale? The last quality is surprisingly hard to come by in recordings of this symphony, and Collins earns my gratitude for not turning Mozart's last symphony into the marmoreal memorial it so often becomes. As for Davis, he finds a sunny Beecham-like quality in the other three works. One could imagine a stormier Fingal's Cave or a tauter Fidelio, but the lack of emotional forcing here doesn't sound lazy or involved, just confident. Davis has always trusted the music he conducts to do what it needs to do, without his giving it any special help. Hearing these three performances, we know that we are in good hands, and we can hear the care with which Davis has prepared the orchestra. The sound here is a little shallow, but it is quite listenable. It appears that LPs have been used as the source material throughout this CD-R, and ReDiscovery's David Gideon has done his usual excellent job in cleaning them up and giving them a new lease on life in the digital age. The asking price is only $10 (including shipping), or $4 for a high resolution mp3 download. Both are available from www.rediscovery.us.